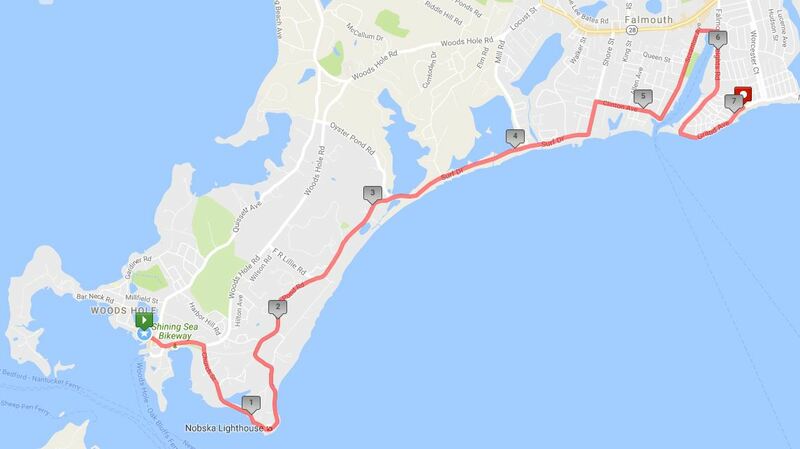 FALMOUTH – From Falmouth Police: “This year’s Falmouth Road Race will be on Sunday August 19, 2018 at 9 am. Our event plan begins with a large police presence in the Falmouth Heights area, Woods Hole area, and other hot spots along the race route. In order to accomplish this goal, all available Falmouth Police Officers will be on-duty during the Falmouth Road Race, along with several other law enforcement agencies. Police officers will be patrolling on foot, as well as by motorcycle, bicycle, boat, helicopter and patrol car. The Falmouth Harbormaster’s Office, Barnstable County Sheriff’s Office Marine Unit, and the Mass State Police Marine Unit (new this year) will be patrolling the waters off Falmouth Heights Beach and Great Harbor (Woods Hole). Explosive detection canine teams from the Mass State Police will be used at strategic locations and the Barnstable County Sheriff’s Office will have canine teams on-site if needed. From above the race, the Mass State Police Air Wing will monitor for any suspicious activity and supply the command center with streaming video to help make decisions in real time. Heavy trucks and equipment supplied by the Dept. of Public Works will be used to block key streets in and around the event area to protect the runners and spectators. As in years past, traffic will be restricted from entering Woods Hole and the Falmouth Heights area. Woods Hole and roads along the race route will be opened after the last runner has passed. Please expect travel delays. Woods Hole (Starting Line Area): Water Street in Woods Hole will be closed to vehicle traffic at 5:00 am. Boats will be restricted from accessing the Eel Pond Bridge Dock on Water Street and the Commercial Fishing Dock on Albatross Street from 5:00 am to 10:00 am. NEW Sippewissett Road, between Ransom Road and Quissett Harbor Road, will be closed from 5:00 am to about 10:00 am. Please also refer to the road closure maps below. Falmouth Heights (Finish Line Area): Grand Avenue will be closed from Walden Avenue to Worcester Court at 4:00 am and reopen later in the afternoon. 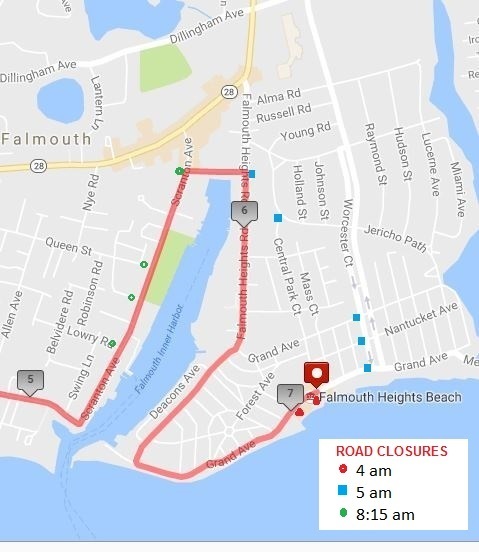 Select streets in Falmouth Heights (see map) will close at 5 am and stay closed long enough for runners to clear the finish line, and for clean-up crews to properly police the area. Please also refer to the road closure maps below. 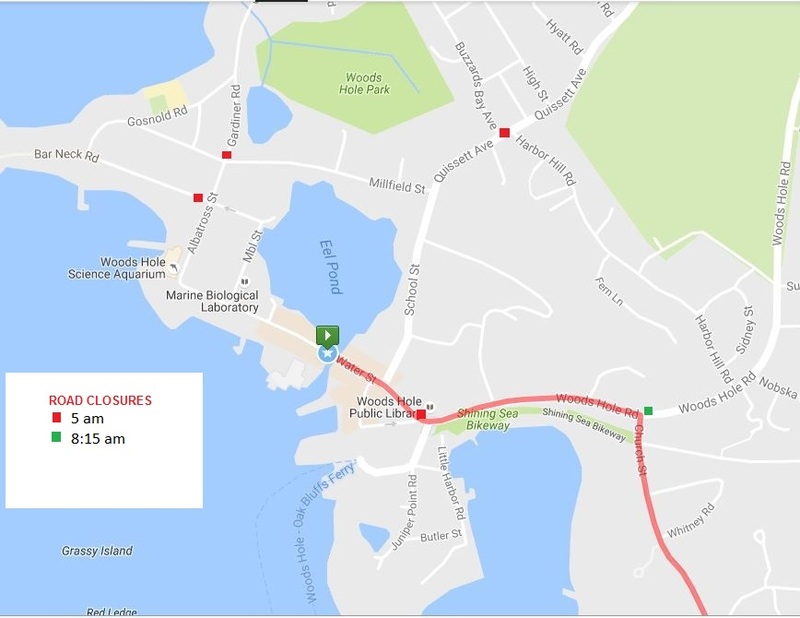 Falmouth (Race Route): All other roads along the race route leading from Woods Hole to Falmouth Heights will be closed to ALL vehicular traffic at approximately 8:15 am and reopened soon after the last runner has passed. Please also refer to the road closure maps below. Alcohol Prohibited: The Falmouth Road Race is a non-alcoholic event, and all laws governing the possession and consumption of alcoholic beverages will be enforced. Public Consumption of Marijuana Prohibited: The public consumption of marijuana is prohibited in the Town of Falmouth, including at the Falmouth Road Race. All laws governing the public consumption of marijuana will be enforced. Parking: Motorists should make every effort to park their vehicles in proper parking areas, as illegally parked vehicles will be towed. Parking information (2017 Update: Parking on the grass median of Worcester Court is now prohibited) The closest handicap parking is available at the Bristol Beach parking lot. More Information: For detailed Falmouth Road Race information please contact road race personnel at 508‐540‐7000 or view their website.